The museum invites you to a three-day trip to Bentonville, Arkansas, to view the exhibition American Made: Treasures from the American Folk Art Museum at Crystal Bridges Museum of American Art. The exhibition is organized by the American Folk Art Museum, New York, in collaboration with Crystal Bridges Museum of American Art. American Made features more than one hundred artworks including quilts, paintings, furniture, sculpture, weathervanes, works on paper, and more from the museum’s renowned collection. The exhibition examines the role that artworks like these have played in shaping the visual and national identity of the United States. It is the first presentation of American folk art at Crystal Bridges. Enjoy an itinerary filled with art and architecture, including a tour of the Bachman-Wilson House designed by Frank Lloyd Wright, which has been reconstructed at Crystal Bridges; tours of Crystal Bridges; a visit to the Museum of Native American History; a lecture by Judy Chicago; excursions to renowned folk artist studios in nearby Fayetteville and Eureka Springs; and other attractions. Ticket price includes round-trip flight from New York City, deluxe hotel accommodations at the 21c Museum Hotel for two nights, porterage, ground transportation for excursions to Eureka Springs and Fayetteville, Arkansas, Friday dinner at the Hive, Saturday lunch at Eleven Restaurant, Sunday buffet breakfast at the 21c Museum Hotel, museum tours, and lecture. Taxes and gratuities are included. For more detailed information or to purchase a ticket, please contact Rebecca Kaplan at rkaplan@folkartmuseum.org. Image, above: View of Walker Landing and lower pond from the overlook at Crystal Bridges Museum of American Art, photo by Dero Sanford. 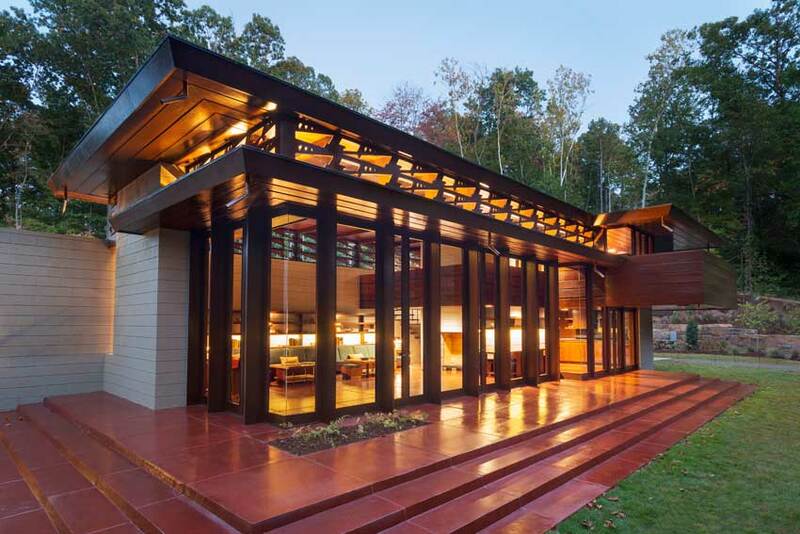 Below: The Bachman-Wilson House designed by Frank Lloyd Wright, photo by Nancy Nolan Photography, copyright 2015, courtesy of Crystal Bridges Museum of American Art.